Johnny is a marshall who infiltrates a bank robbery gang. BAD MEN REACH FOR THE SKY! Watch Out For These Two When Six-Guns Start Blazing! U.S. Marshal 'Nevada' Jack McKenzie: Well, there she is, Sandy: the great city of Verdine. U.S. Marshal 'Sandy' Hopkins: Yep, right where they said she'd be. Despite a very familiar plot,, I also found it entertaining and worth my time. 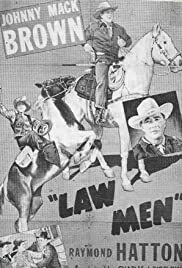 This film stars Johnny Mack Brown and Raymond Hatton--two very familiar B-western stars. While Johnny was a star, Raymond made a huge number of films at the #2 or #3 friend--and here he plays Brown's friend and colleague. The pair arrive in town to investigate some stage coach robberies and like so many of these B-westerns, the pair are US marshals AND go incognito. Brown insinuates himself into the gang in order to figure out who 'Mr. Big' is (again, a familiar plot element) and Hatton is a good-guy who has come to town to make boots (a job he is ill-equipped to do). Between the two of them, they manage to avoid death when Brown's secret is exposed AND make he actually care because I felt like I'd seen this film many times before. Why? Well, I think there are two main reasons--there was no singing to clutter the film (which sometime seemed to get in the way of plot in some of Roy Rogers' and Gene Autry's films) and the acting was very good. Hatton was wonderful as always as a funny but surprisingly competent sidekick and Brown was his usual solid self. All in all, an enjoyable film that kept my interest.